This is beautiful Karren! That bird looks stunning in black and the pretty white scalloped border looks so nice! There's always a back story... ;) A very unique card came out of this challenge, and I love it! 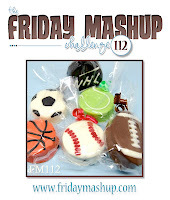 Thanks for joining the Friday Mashup this week. Black and white are so striking together. And I always love polka dots. Thanks for joining us at Freshly Made Sketches this week! Hmmm, I might become a fan too! LOL! This card is fabulous!! This bird is the cool friend of the blue bird!! Glad to see you this week at FMS! You did a great job combining black and white. It is a gorgeous card!